Recently (read: the latest release) the Infragistics Excel engine got a set of neat enhancements to further improve the control you have over exported or imported files. For those that are not yet familiar – it’s a library that allows you to create and interact with Microsoft® Excel® documents. It is completely independent (so no automation going on) and it provides you with a elaborate Workbook object model, along with all the well-known things you’d expect to find in it – worksheets, columns, cells and formulas. With the engine’s independent nature you can enable your applications to reliably read and create the popular format with support for a wide range of versions of the office product. In case you’ve been to our documentation, it’s worth mentioning that this library can be found under the platform specific section and there’s a good reason for that – the Silverlight version runs entirely on the client, so no round trips to request and download from the server! Now lets see what new is added to this already very useful engine. Infragistics Excel is now more capable of delivering the file with just the right looks to aid you user or just improve the overall experience with generated files. That is achieved with support for styles and formatting options. Two more neat tricks that provide more control the IWorksheetCellFormat interface (also implemented by the row and column base class) now has Style property that would returns a reference the parent style for rows, columns and cell formats and the very same interface also provides a GetResolvedCellFormat method to get the current style. The important part here is that even if the cell or style format have special Fill or Border values defined, for this particular cell the Options will only apply the Font and alignment, while the rest will resolve to the default values. As you can tell you will have to swap one color for another and it can get somewhat messy at some point, but not to worry - it can be reset and comes with a built-in GetIndexOfNearestColor method you can use to see what color would be seen by users in 2003 version. Seems like we can never get enough of them and the latest version of the Infragistics Excel Engine comes with support for named tables inside your worksheets! Table in Microsoft Excel® terms would be a rectangular region of cells with it’s data organized into columns. The table can also have headers and a totals rows. The library allows not just to create but also to find such regions by name. For the example I’ll add another table with Suppliers data for the purposes of the demo, the code for it is basically the same as above, sans the row indexes. Once that is done you can give your tables some style, quite literally. 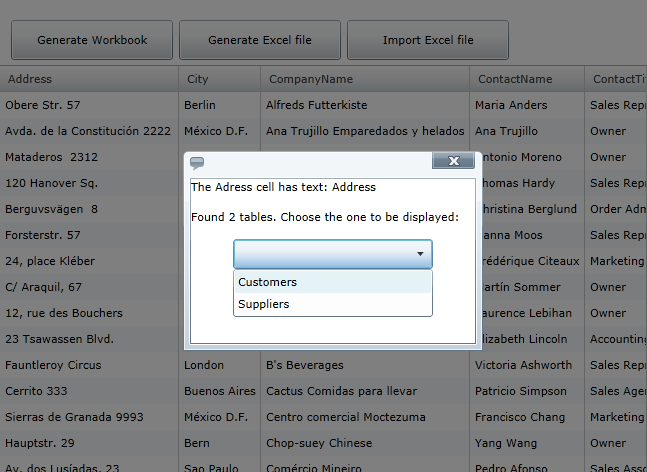 For that goal the access to the table can be done via the Tables collection exposed off the Worksheet object and the styles collection in the Workbook class. 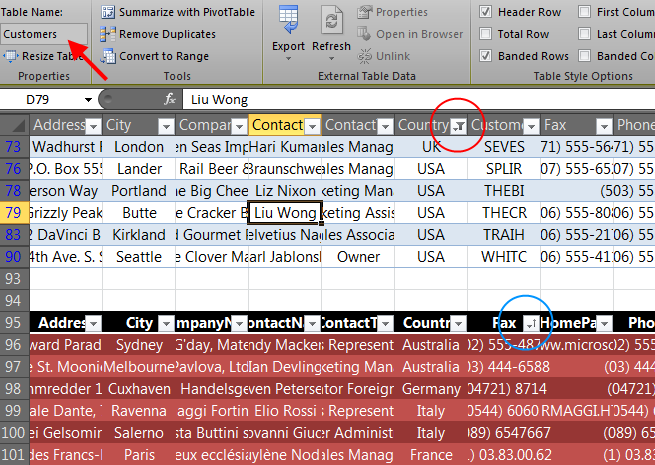 The latter is not the same as the default styles described above, but a separate collection of again about 60 styles specific to tables, which again mirror the ones you can find in Excel when designing tables. As you can tell or already know, table styles are in 3 groups light, medium and dark(or full colors). Those are the Customers and Suppliers tables as created above, their names appear in the Table designer along with the Styles we picked for them and you can clearly see the Country column has a filter applied and the Fax column below is sorted. I believe this can prove really useful to some of you, so find the full code in the demos below. The Infragistics Excel Engine got some very useful and eye-pleasing additions – from various formatting options and styles to tables and named references for the same and getting the actual final text the user would see in a cell – all making an already powerful Excel Document object model that much more useful and giving you extra control to bring the files you generate closer to what can be done with the actual software and also closer to the functionality you desire! It’s event totally client side for Silverlight application, so the possibility for some offline action is there, too! An elaborate model like this however is what you could call vast – plenty of knobs to tweak, so to speak. For that reason i strongly suggest you pay a visit to our Documentation and also try the Samples. Here are the links for the demos – a Silverlight project and a WPF project (besides the assembly names, there are barely any differences between the code regarding the Excel Engine). Keep in mind you will need at least a Trial versions of NetAdvantage 2012 vol.1 for Silverlight or WPF respectively to successfully build and run those projects. Follow us on Twitter @DamyanPetev and @Infragistics and stay in touch on Facebook!